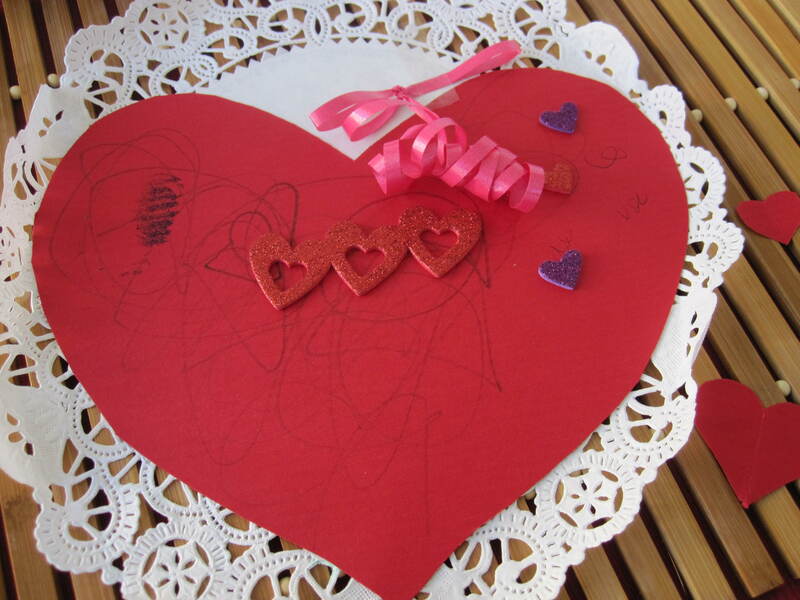 This year, Valentine’s Day was quite fun as Bebe E and I enjoyed a number of arts and crafts together. We decorated the house with little paper hearts. 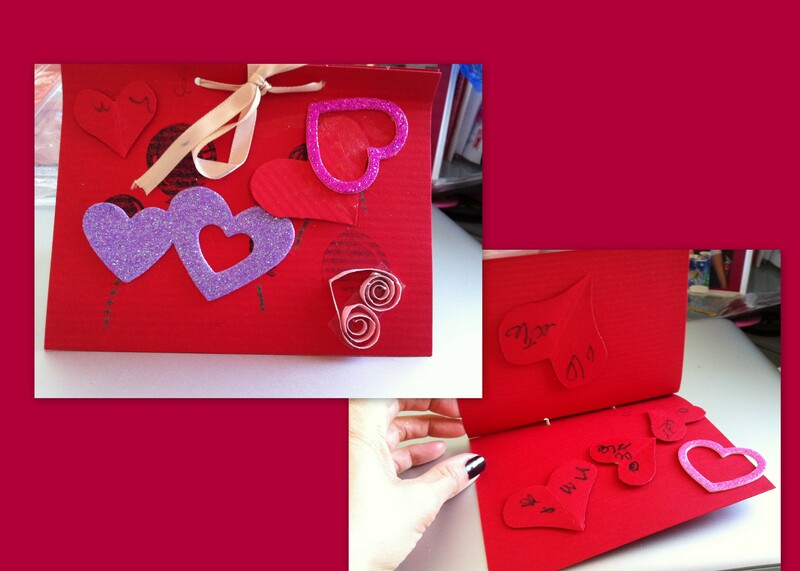 Then she made mommy a Valentine’s Day card. Yes, I helped by tying two pieces of red card stock together with ribbon, making little cut-outs and buying some supplies at Michael’s half-off. :) I also helped to stamp the balloon images so that the ink would show up, but the rest was all her. Such a sweet heart, my little Bebe E.
Next, she made pretty Valentine doily and heart gifts (featured at the top of the post). Finally, she made little lady luv bugs to give as gifts. 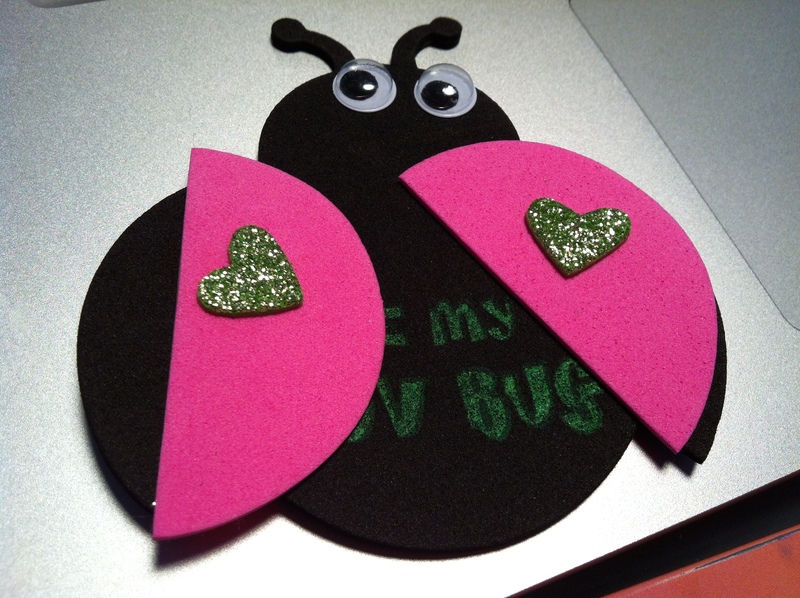 The message on the ladybug says, “Be My Luv Bug” but most of the ones created read, “My Bug”. So adorable. What I thought was interesting is that she had the choice of three different colored hearts to stick onto the wings of the ladybug but for each ladybug (there were 6 in our pack), she consistently chose matching colored hearts. So the one above is the green-hearted ladybug. The others were pink or purple. Never once did she mix-up the colors. I think she might have inherited Mommy’s A.R. gene… Which isn’t a bad trait! I was also impressed that the majority of the eyes she attached to the ladybugs were pretty well-centered. OK, enough of my motherly observations! We had a blast. I think what she enjoyed the most was decorating cupcakes. 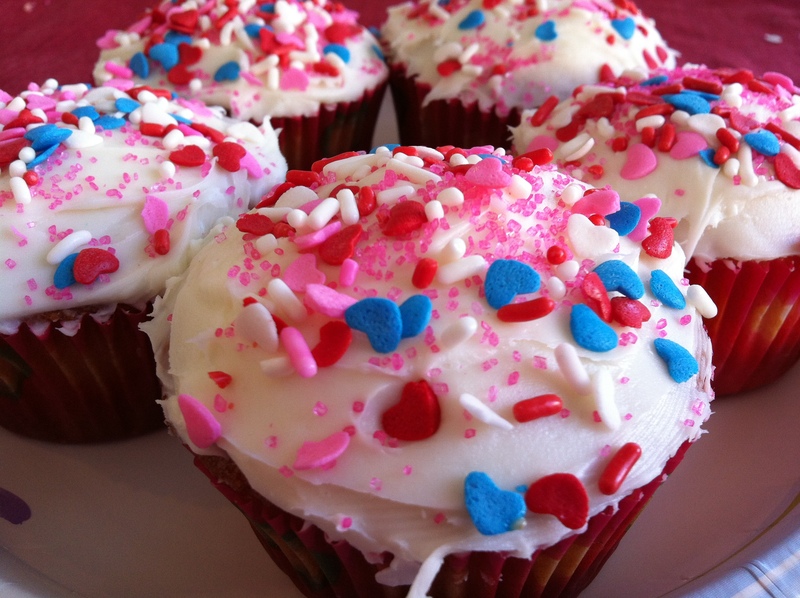 She loves decorating cupcakes with sprinkles. Ever heard of the books, “If You Give a Cat a Cupcake” or “Pinkalicious”? Those are two of our favorite children’s cupcake books. Now I’d like to share a very famous Valentine’s Day quote that I hear or have heard annually for years… and years…. If every day is Valentine’s Day, once you’ve found your true love, why is February 14th any more special than January 3rd, or May 15th, or July 27th, or October 8th? I’m sure the 20 or so men that I saw at 5:00 PM on February 14th roaming Albertson’s carrying bouquets of flowers were wondering the same thing. What was I doing there? Buying almond extract, of course! Perhaps Valentine’s Day is a simple reminder to give thanks for a special someone and to let them know that they are appreciated and loved. I don’t have to worry about poking fun at my brother on my blog since he never reads my posts… he just scrolls down to the recipe. He already knows I talk too much and subsequently my blog is just another platform for my blabbing which he is happy to bypass. Hahaha! So, knowing that he doesn’t read my blog I will share with you that for many years now I enjoy giving my sister-in-law a little token of love, whether it be in the form of m & m’s or cupcakes that Bebe E decorated, just because my brother refuses to buy into the commercialism of Valentine’s Day. A plate of cupcakes that Bebe E decorated for each member of my brother’s family. As she decorated each one, she said, “this one for ___” and continued to name each person in my brother’s family. During our Valentine’s Day dinner, Nene (or Nechan) which is what Bebe E now calls her big sis, Big Onechan, brought up another name for Vday. She said, “It’s either Valentine’s Day or it’s Single Awareness Day”. I’ve never heard of that one before. Our teenager makes us laugh. Bebe Dada was quick to point out that the acronym for the latter was SAD. Well, I’ve certainly had my share of SAD’s during my singledom on February 14th’s past, but I vaguely remember there were SAD’s where my sad girlfriends and I got together with other sad friends and went to a bar or a club to celebrate or drown our SADness. At the end of the day, it wasn’t so bad, and in fact, fun. At dinner, Bebe Dada asked Nene, “Did anyone give you a Valentine gift today?” She said, “Yes.” Of course I immediately jumped all over that with, “Wait, in the car on the way home from school you told me nothing exciting happened at school today on Valentine’s Day!” But clearly, I hadn’t worded my question correctly but it turns out I jumped the gun, because receiving a Valentine treat from your lab mate who happens to be a girl that sits next to you in Science class who also gave a bunch of other students the same Valentine treat as a gesture of good will and kindness, doesn’t constitute an “exciting event” during a teen’s school day. It is my suspicion that Bebe Dada was extremely RELIEVED that Big Onechan was not a recipient of any meaningful Valentine gifts from any boys, nor was she the bearer of any special Valentine gifts. This one was a pretty cupcake that Bebe E decorated. So if you got the impression that my husband and I stayed home on February 14th and ate dinner with the family, you guessed correctly. That’s how it goes being married with kids on a school night. I made my Mom’s homemade gyoza for dinner, in case you are wondering what I cooked for my family on this special occasion. Bebe Dada mentioned that gyoza sounded good this week and he rarely has an opinion about what he cares to eat during the week, so I ran with it and made gyozafor him and the girls. I was trying to remember the last time my husband and I actually went out to celebrate Valentine’s Day. It must have been prior to my pregnancy with Bebe E. When I was expecting, I was too nauseated to think about food, but the year before that was likely when we last celebrated Valentine’s Day but I have a feeling we stayed home and I made dinner. The restaurants are always SO overcrowded on Valentine’s Day and it’s much easier and nicer staying in and cooking. My gift to my valentine this year was almond jello. We occasionally eat almond jello with my husband’s family when we get together and I remembered that he once told me that his mom used to make almond jello for him quite often when he was a child. At our family get togethers, if almond jello would make an appearance I could usually hear his excited voice across the room saying, “Oh wow!! Someone made almond jello!! 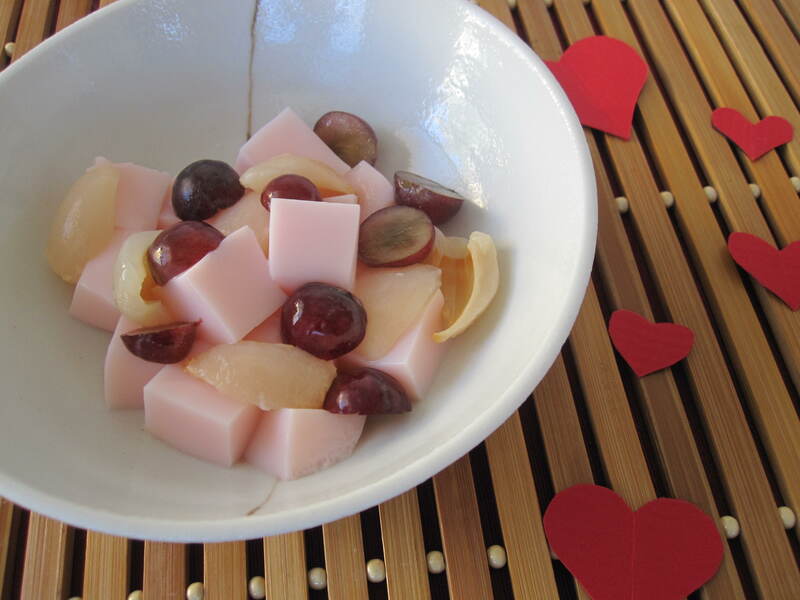 !” Below I share with you my husband’s family almond jello recipe. My little almond jello thief was impatient for her share of this special treat. 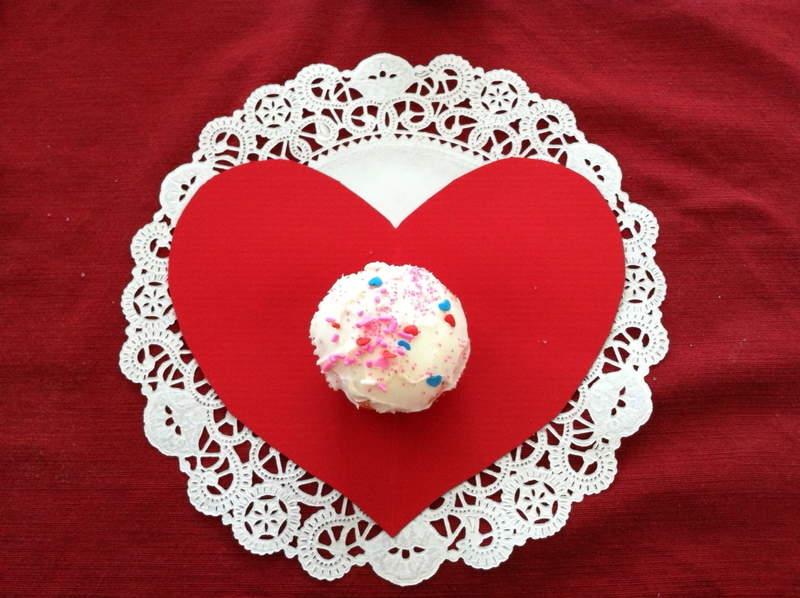 She was also miffed that her little red hearts that I cut out for her were displayed on the placemat of my “photo shoot”. She kept saying, “those mines” while grabbing the hearts and also saying, “I wanna eat almond jel-woah mommy. Zat all mines?” Heh. Love her baby-talk. I’m not a fan of canned fruit so my fruits of choice were grapes, blueberries, strawberries, and cherries. My favorite was the strawberry and blueberry combination. I did, however, have a can of lychees in syrup in my pantry which I sliced and topped the jello with. Yum! Note: The recipe above is tripled from the original recipe. 1. Soak gelatin in water. 2. Scald milk, add sugar, stir until dissolved. 3. Add gelatin; stir until dissolved. 4. Remove from heat and add almond extract and food coloring. Our almond jello is typically pink so I of course added red food coloring. It was a perfect shade of pink, perfect for Valentine’s Day, but of course my camera doesn’t do the pretty blush justice. 5. Refrigerate until the jello sets, about 4 hours or overnight, if you prefer. 6. Cut jello in little squares and garnish with your favorite fresh fruit, or pour fruit cocktail (and syrup if desired) on top. 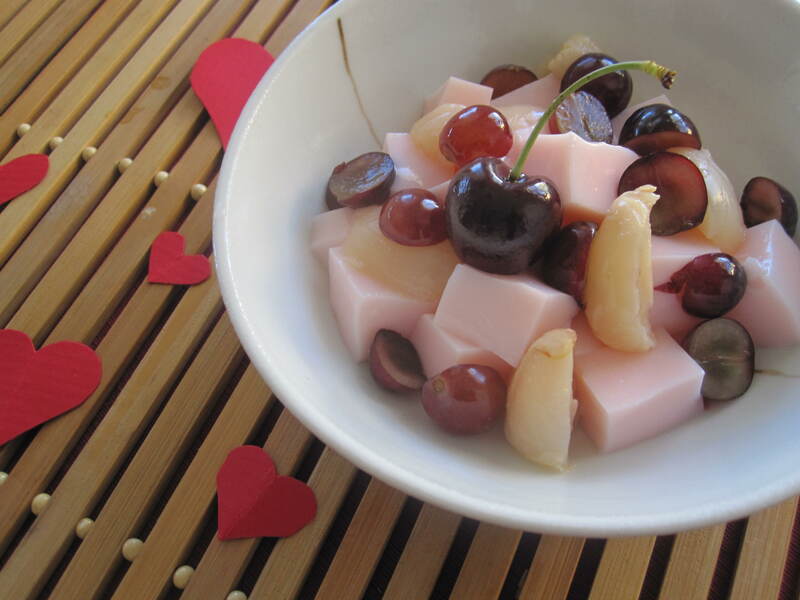 Almond jello garnished with sliced lychee, grapes and cherry. My favorite (not pictured) fruit combination was strawberries and blueberries. So yummy! Hope your February 14th was fabulous. 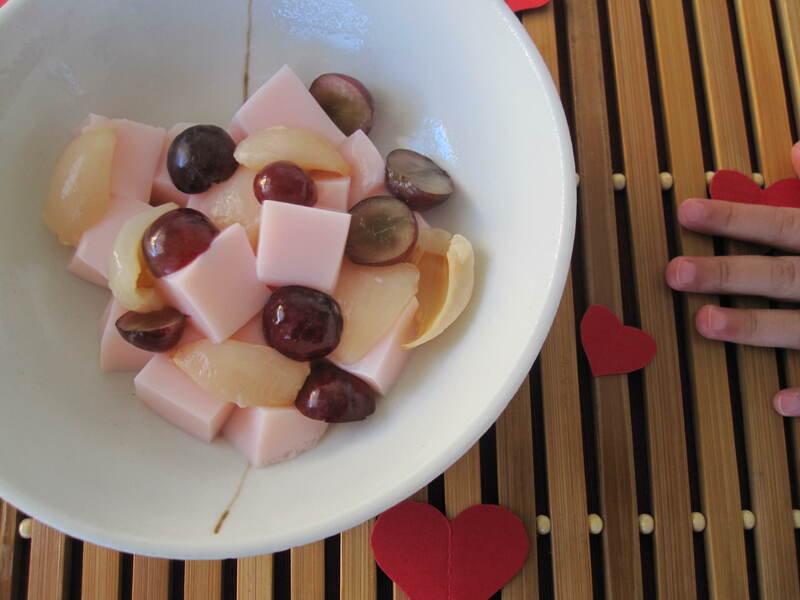 This entry was posted in Bebe E's Favorites, Crafts, Desserts & Treats, Family Favorites, Special Occasions, Traditional Holidays and tagged Almond Jello, Asian Dessert, Chinese Dessert, Valentine's Day by Judy | Bebe Love Okazu. Bookmark the permalink. Everyday is Valentine’s Day… great quote. Hi! Nice surprise to get a comment from you! No pink nail polish on her fingernails. Just good blood flow in her baby nails. :) Hopefully we’ll see ya soon. Sounds like you and Bebe E had a wonderful Valentine’s Da!! Loved the pics of her creations!! Luv Bugs are adorable!! Cupcakes look yummy and Bebe E did a great job decorating!! Good job!! Again, enjoyed reading your post about SAD day!! Aloha Girl! :) Thanks for stopping by and leaving a comment for me! Missed ya! We indeed had a fabulous not sad, SAD day! Somehow I missed this post — we were in CA at the time, visiting you! ha ha. The cupcakes and craft are soo adorable! What a craft maven and baker Bebe E is! That is sweet of your husband to make you a new play list — also sweet of you to make almond jello. Sounds delicious – I’m going to try it! Thanks for the kind words, Melissa. Hope you’ll enjoy the recipe. It’s super easy!